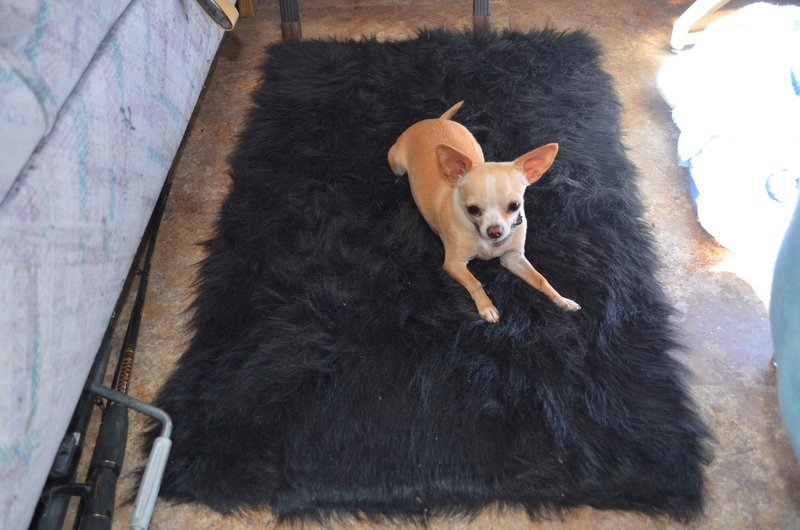 I stopped in a Bed Bath and Beyond store and they had a neat fake animal rug for 50% off. I couldn’t resist as I thought Chica would love it. Sure enough she went crazy on it. Then she finally settled down but now is sound asleep on it. I also made a stop at Petsmart where I picked up some food and also a NEW ducky to replace the old ducky that somehow got lost. I have torn up the place looking for it but it was never found. It always has been here favorite toy so I just had to replace it. 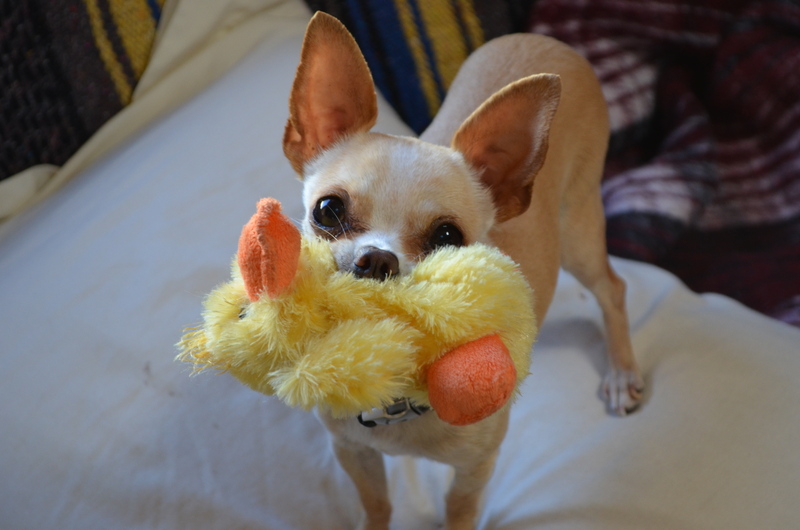 Here is a pick of her with the OLD ducky. 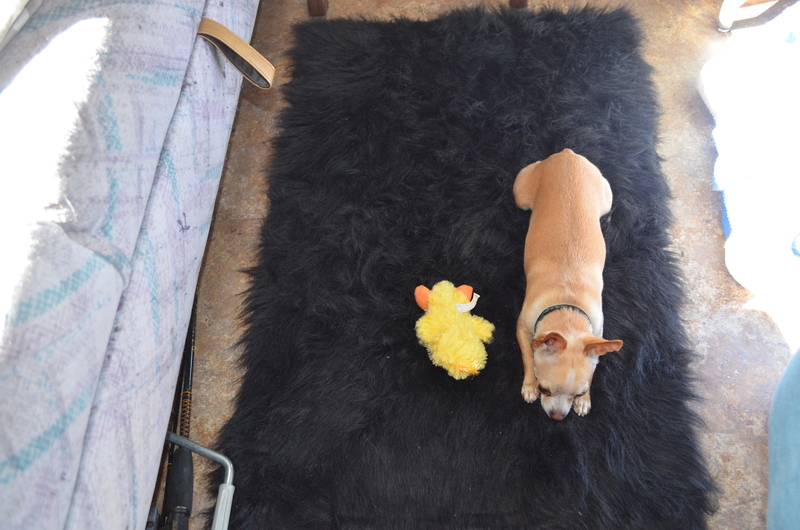 Her she is with her NEW ducky resting on her new rug. Chica sure lives a great life!! Me too!! This entry was posted in Chica and tagged Chica by Jim Melvin. Bookmark the permalink. She is one spoiled dog!!! You two enjoy your travels. Sooo sweet! You really know how to treat a gal! She does love that rug and who could blame her. So comfy. Chica is one lucky little lady to have been rescued by you. I can see the love. She sure has brought joy to your life along with some good company. Very glad you two have one another! She is cute with her mouth full of duck. She is the perfect little rv dog. I love that Chica. Camphosting in WA. I’m going to pay attention for future reference. All the tips I get from you have paid off so far. I think I saw your RV at the Pismo Beach outlets today. Are you in the PB area? No I am in still in Yuma finishing up some dental work. Jim the wind has been blowing from the south all week…….I think I saw your lost duck here on the shores of Lake Mead.